There are always those who will defend coffee and claim that it is a healthy stimulant. It is true that scientists have found some benefits of coffee but at the same time they have found far more numerous negative effects. The only benefit I actually agree with is that it is one of the best enemas out there, haha! With coffee, it is better out than in :). Coffee’s acidity is way too strong for our stomach…truly the cons outweigh the pros. There is only one thing in nature that can truly kick your coffee addiction and that is Matcha. There are many caffeinated teas on the market such as Mate but they don’t provide the same energy, endurance and mood enhancers associated with Matcha. Only Matcha can increase energy and endurance while decreasing stress and boosting your mood. Coffee does the opposite…it increases energy for a shorter time but actually disrupts the balance of your central nervous system, wreaking havoc internally and creating stress. As soon as the coffee high is gone your mood is dropped rather than elevated. With Matcha lattes you get the alertness without the jitters generally associated with coffee. Matcha is the absolute best alternative to coffee and truly is the healthiest energy drink! So what does Matcha have that coffee doesn’t? Aside from the numerous nutrients and antioxidants it also has the amino acid “L-Theanine” – while matchas caffeine is released into the blood stream so is the theanine which relaxes the nerves and releases dopamine in the brain. This chemical reaction creates that happy feeling often associated with eating chocolate. So really Matcha is one of the “happiest” drinks on the planet. Who doesn’t want to experience their mood completely lifting and brain ready to take on the day with a skip in your step? The caffeine in regular teas and coffee creates that jittery and even anxious affect while Matcha is opposite. Due to Matcha's combination of phyto-nutrients and L-Theanine, matcha caffeine is assimilated in a very different and much healthier way than coffee. The potential negative effects of caffeine are offset by the relaxing and calming influence of the amino acid L-Theanine. The combined effect is a state of mental clarity, calm alertness and sustained energy. Matcha caffeine is released into the bloodstream slowly over time and the result is a slow dissemination of caffeine that provides sustained energy for up to 4-6 hours. This synergy within Matcha also prevents the insulin and adrenalin spikes typical for coffee intake, so with matcha green tea lattes you never have to experience the "crash" that follows when your blood sugar drops. On another note I want to mention that Matcha is very heart healthy because it not only controls blood pressure and helps with cholesterol but it also helps to reduce visceral (abdominal) fat which is directly related to heart health. Coffee on the other hand is acidic and actually adds to the storage of visceral fat. Plus the caffeine in coffee worsens hypertension and really does nothing positive for the heart but rather only harms it. I have worked with numerous clients who have spent years trying to get off coffee but never found the right answer…regular caffeinated teas never gave enough “pow” to their system which I understand very much which is why they still had to at least have 1 cup of coffee in the morning to start their day. Personally my Matcha latte is the only thing that gives me the right kind of energy and focus I need. Making the switch from coffee to Matcha is not very difficult because your body will not go through withdrawals of energy, rather you will wake up ready and excited to get your Matcha on :). Matcha will give you so much energy that you won’t miss coffee at all. I know that many of you enjoy the taste of coffee. Got Matcha’s flavored blends are a tasty treat that really help in making the transition for those of you needing that flavor. Make yourself a creamy matcha green tea latte with the Matcha cacao and thick coconut milk or almond milk and your taste buds will feel like they are getting a fancy latte from a coffee shop. For some, drinking the plain Matcha with milk and/or water does the trick but for most adults we love to have that warming delicious drink in the morning to get us going which is why the flavored Matcha blends will become your best friend. So I recommend having a flavored matcha latte in the morning to trick your brain into feeling like you had a coffee latte. For those who just need the energy then you could drink the latte or do like I do and add a teaspoon of plain matcha to my morning matcha green tea smoothie. In the afternoon when you feel like a treat and need that boost of energy have a matcha iced green tea latte. A quick and favorite way is to shake up the matcha in a shaker cup with coconut water and almond milk…very refreshing. For some coffee lovers who just love that flavor, enter Got Matcha’s latest blend, Matcha Mocha. In the past we have had customers work with the Matcha Cacao to give them a bit more of a Mocha feel, but one of our newest blends, Matcha Mocha (we used to call it Matcha Café Mocha – but everyone thought we had coffee in it!) does the trick. This tea is amazing and truly one of our favorites. Perhaps you’ve already given up coffee and miss that heavenly aroma of freshly brewed beans in the morning, or maybe the idea of giving up your morning cup o’ Joe is horrifying despite the fact that you know it would be better for your health. You may already be a convert to the wonderful world of Matcha, but, let’s face it, while the health benefits of Matcha green tea put coffee to shame and the Matcha blends are indeed delicious, nothing can replace that authentic coffee taste. Until now, that is. 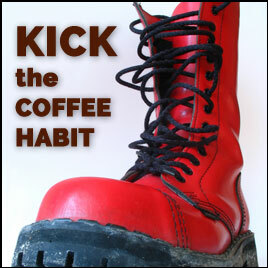 With Matcha Mocha you can truly GIVE THE BOOT to coffee!! So lets talk about the “Magic” behind our Matcha Mocha tea….. The Magic behind Got Matcha’s Matcha Cafe Mocha is the synergistic blend of spices & ingredients such as Chicory, Barley Grass, Raw Cacao, Raw Carob & more. After months of taste testing we arrived at our Cafe Mocha - the perfect alternative to coffee, without the coffee! and with all the wonderful energy and health of pure Matcha. Surprisingly, when we launched Cafe Mocha last summer, we mentioned on the label ... “a hint of coffee” and little did we know that everyone thought it had coffee! So, the Cafe Mocha didn’t catch on, because everyone thought we had blended coffee and Matcha. We have changed the labeling and want everyone to know - no coffee! And this is by far one of our most favorite blends yet. Aside from an incredible taste, we used many spices and herbs in the formulation of this tea that truly put Matcha Mocha in the “super tea” category, with numerous health benefits. Chicory Root: A popular herb that is used as a caffeine-free replacement for the flavor of coffee. Chicory root has been around for centuries...Ancient Romans used the herb to help cleanse the blood. Egyptians consumed chicory root to help purify the liver and the blood. Chicory helps digestion in 2 ways...Helps increase bile production during digestion which helps to break down fats, making it very helpful for liver and gallbladder health. Also chicory root is one of the richest plant sources of inulin, a soluble fiber which actually feeds the healthy flora in the intestines and enhances digestion. Also a great source of antioxidants, is anti-inflammatory and even has anti-fungal properties. For an authentic Café au lait experience, warm some almond, hazelnut or oat milk in a saucepan over the stove and let warm slowly. Add 2 teaspoons – 1 tablespoon of your Café Mocha powder and stir. Pour into a mug and sip your green tea latte slowly as you close your eyes and imagine yourself back in that French café indulging in a warm, comforting Mocha latté without a care in the world. **does not contain coffee!